More than 2 million households use Angie's List to find high-quality service companies and health care professionals in over 700 categories. 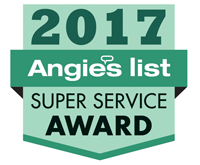 Pure Comfort Heating & Cooling is a proud recipient of the Super Service Award which honors service professionals who have maintained exceptional service ratings and reviews on Angie's List. 2017 Super Service Award winners must meet strict eligibility requirements, which include maintaining an "A" rating in overall grade, recent grade, and review period grade. The SSA winners must be in good standing with Angie's List, pass a background check, submit a current trade license attestation and abide by Angie's List operational guidelines.